South Africa is a country that is home to some of the most iconic stadiums; the biggest stadium is situated in Johannesburg. The FNB Stadium seats more than 94,700 sports fans. The stadium was built for the 2010 FIFA World Cup, and once the world cup ended, the stadium hosted several international acts as well as sporting events. While the FNB Stadium is still in use, several of the other stadiums built especially for the FIFA World Cup has never been used since the tournament ended. The Cape Town Stadium is the sixth largest in seating capacity in South Africa. It is widely known that it has been struggling since the World Cup to find any use. Moses Madhiba Stadium seats 54,000 visitors and is situated in Durban on the Natal Coast of South Africa; it is one of the sports stadiums that features a unique design. It was a lot more successful as an events venue than most other stadiums. The Moses Madhiba Stadium is used for rugby union, football, concerts and even bungee jumping. Apart from the stadiums that became famed during the 2010 World Cup, the country also has several other sports stadiums, which includes several that are amongst the largest in the country. 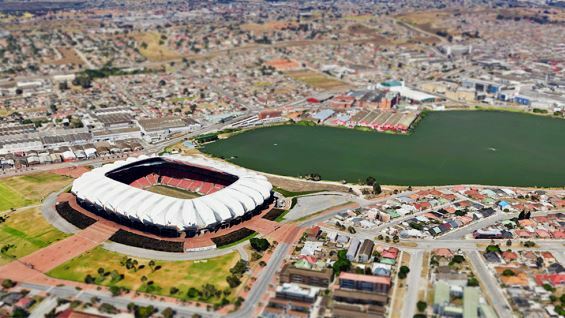 Some of the stadiums situated in larger metro areas are used continuously and includes Orlando, Ellis Park and Loftus Versfeld. The Odi Stadium in Mabopane is one of the largest South African stadiums and due to lack of maintenance has fallen into a total disrepair state since 2010. The Odi Stadium has not been used at all since the FIFA World Cup and with its seating capacity of 60,000 is the 3rd largest sports stadium in the country. The fate of this stadium is now in the hands of sports clubs and the community. In design the Mmabatho Stadium in Mahikeng is similar to the ODI Stadium, it is only a tiny bit smaller and seats around 59,000 visitors. Apart from a few sports events, the Mmabatho Stadium is mostly used for political rallies by the ANC, while the North-West University also uses it as training grounds. While the FIFA World Cup organisers hoped that South Africa would enjoy great joy from the World Cup Stadiums, most became white elephants since. Monies that should be used for the upkeep of the sports stadiums are misused and lost in corruption. The Moses Mabhida Stadium runs as a loss, and at the same time, it costs the municipalities millions. During the 2010 tournament, the Durban stadium hosted 92 events, Cape Town only 25 events, while the Royal Bafokeng hosted only 29 events. All the other stadiums including the Free State and Ellis Park Stadium just hosted twelve events. The most expensive stadium of the world cup was the Cape Town stadium, and it is now the stadium that battles the most to find events to host.